Glyphs & Graphs is a writing experiment by Naveen Srivatsav - an attempt at hypertext wordplay, intentionally amorphous thought experiments non-committal to any specific genre or topic. Enjoy, and feel free to reach out via social media. Let me present a tenuous line of reasoning brought into being while pondering the difference between Man and other apex predators. The implications of Man's diplomacy as a function of intelligence, itself a by-product of selective evolution, proposes an alternative to the archaic solution we call war. Let's start with Maslow's hierarchy of needs, which are the pre-requisites to self-actualisation. Let's consider morality to be one of the aspects that define a self-actualised person. 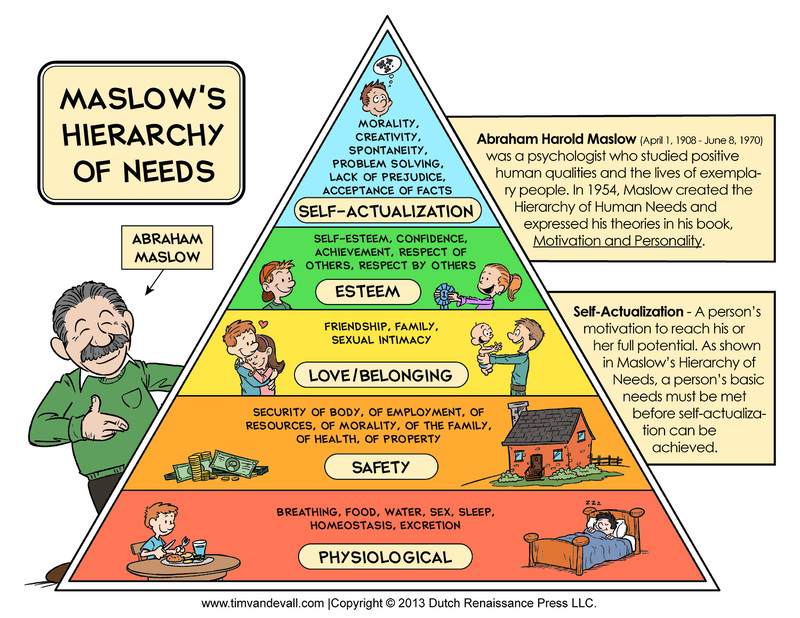 Now, according to Maslow, you can only get to the self-actualisation stage if all the lower rungs are satisfied. One critical element in one of the lowest rungs is "sense of safety and security" - that is to say, one can only begin to consider higher thoughts when sufficient attention is diverted away from the constant paranoia of having to keep oneself alive. When we distinguish between a city and a jungle (as habitats), the biggest difference is the law of the land, wherein the social contract attempts to transcend the natural order of Darwinian survival. To put it in simple terms, in a civilisation, most humans can look forward to not being in danger from the elements, wildlife or each other. My proposition is that these the two are not only correlated, but causal. That is to say, safety and security (as pre-requisite needs) are essential to arrive at a rational understanding of the social contract. Morality cannot thrive in an environment of brutality. If and when one is forced into survival mode however, I posit that rational thought is as good as non-existent, if only because the largest extent of brainpower is now devoted to crunching strategies for ensuring survival. It takes a rare breed to stay composed (as much as can be reasonably expected) even in a situation of abject adversity. Consider the effects that kind of constant immersion in danger might have on the body. From a high basal adrenaline constantly streaming throughout the body, to a significant extent of the brain's resources working on crunching a large bandwidth of sensory data for every microsecond advantage, muscles primed and in top gear at all times. The physiological stress of that must be unimaginable - rapid ageing, among other symptoms - is a distinct possibility. Not to mention the psychological habitudes that develop - trust must be a luxury, and hope a redundant hypothetical. This is not mere speculation, but medically proven. How can anyone be expected to participate in "peace talks" in such a state? And now let's speculate about an environment of evolutionary adaptation (EEA). Apes have somehow managed to breach the realm of the apex predators, like some other species. They are truly the most capable and dangerous creatures in the food chains they participate in. By definition, they have no natural predators, and are safe. Lots of other species reach this position, from bears to sharks. Just the removal of constant fear from day-to-day living must have freed up a lot of brainpower, brainpower that can now focus on intelligent efficiency, rather than physiological advantage. Using tools, recognising fire's potential - I posit these were only possible as a result of freed-up brainpower. But why did some apes need to become even smarter? Why did homo sapiens get ahead in the intelligence race? Here, I take cues from the fact that we are (and were) the most populous apex predator. With a growing population comes growing competition, not just for food but also for mates. Of course, early man also moved around in nomadic groups with reasonable numbers. Overpopulation would manifest as multiple groups infringing on each others' hunting/foraging grounds. An animalistic response would've been to attempt to chase away the other groups with aggression. But apex predators are extremely dangerous, even to one other. I posit here that once a species has had a taste of safety and security, it will do whatever it can to maintain that state. Debate and discussion perhaps arose as precursors preventing physical conflict - what else is this but the birth of diplomacy. Similarly, mate selection is also made harder in large groups, mainly because of the abundance of choice. Geoffrey Miller's The Mating Mind posits that the brain after a point, became a sexual ornament; some of the freed-up brainpower was dedicated to essentially the game of seduction, getting others to like the individual. Much has also been written about the remarkable co-evolution of language with the brain. Seduction and diplomacy both require better communication, necessitating better language, and in turn a better brain to out-seduce worthy competitors. What results then is a cycle of virtue. Again, intelligence becomes the new definition of evolutionary fitness. Fast-forward to present day. Mankind is still dominant as the apex predator, and we are our biggest threat. There are still wars, and there is still violence, but the statistics suggest that we are indeed safer than ever before. Absolute morality exists after all, not in nature but in the human code, the social contract. And look at the results. Great sprawling settlements that cover a good portion of most continents - the light of mankind is visible from space! International trade of commodities and culture, the rise of a planetary language, and affordable supercomputers in the hands of millions. But we forget in the rush of modern bustle that all this was possible only because of peace. Incremental feelings of safety and security, I posit, directly led to the exaltation of our species. So, at this juncture, I must conscientiously reject any notion of the idea that "war is a necessary evil". The solution to any conflict cannot be an aggressive response, because that just collectively forces entire peoples into a state of anxiety, if not panic. Expecting morality and rational judgement from so-affected people is not only unrealistic, but also supremely unfair. So what does this mean for resolving the conflicts that have gone on too long in recent history, be it the unrest in the Middle East or the human rights atrocities in North Africa or even the occupation of Tibet? For one thing, I would say the solution to the conflicts necessarily cannot come from within (and if it did, that would be a miracle indeed). We can't expect these regions to solve their decades-long disputes themselves, nor can we expect to reasonably rationalise with them (at least not in the middle of a war). Even a temporary truce may not be entirely sufficient - I'm even considering truces that last generations. OR, we invent a new arena for warfare, that doesn't involve bloodshed. It might sound like a joke, but let me echo Nietzsche here: "Not by wrath, but by laughter, do we kill." Physical violence has the potential to eliminate physical bodies, and that may have even worked in simpler times. But we have come so far. Modern wars are driven by ideologies, by ideas. People are just vessels of ideas, and ideas are impervious to weapons. Physical wars then are just postponing more wars. And so, the solution is indeed to invent an entirely new arena for idea warfare. Imagine building entire arguments virtually and visually, both sides taking turns to best support their stance while adding to the combined inter-related structures. Imagine being able to simulate the consequences of certain actions, and realistically scale the coefficients of factors to match reality (as opposed to magnified perceptions). And the net result is the publishing of a mutually agreeable and explicit payoff matrix. Still can't see it? Elementary, my dear Watson. The final fight scene between Sherlock Holmes and Professor Moriarty from Sherlock Holmes: A Game of Shadows (2011). To clarify, I'm not advocating a software or platform that can calculate the possible outcomes of war, so as to merit the discussion "Is war worth it?". No, definitely not. I'm trying to deal with the debate before it escalates to war. There is a debate because of mutual disagreement - and this arena should allow the conflicting ideas to wrestle it out. Again, this match of idea against idea isn't to determine a victor, at least not numerically. Rather, the ideas themselves become the parameters and boundaries to define mutually agreeable solution spaces. Imagine a virtual (and visual) argumentation arena, that is less used for determining what is right or wrong (which is a matter of perspective), but rather sustains intelligent, transparent, competitive and optionally participatory modelling of the problematic system, thus generating multiple solution spaces. And why does it have to be purely the future of conflict resolution? It could be the future of language and intellectual expression itself - à la Herman Hesse's Glass Bead Game. What say you? Feb 4 What defines you? Lovingly written and curated from Delft, The Netherlands. All content on Glyphs & Graphs is subject to a Creative Commons BY-NC-SA license.